Nathan Lake of Chevak received the 2017 Yukon Kuskokwim Health Corporation Health Aide of the Year Award at the health corporation’s annual Tribal Unity Gathering on April 5, 2017. 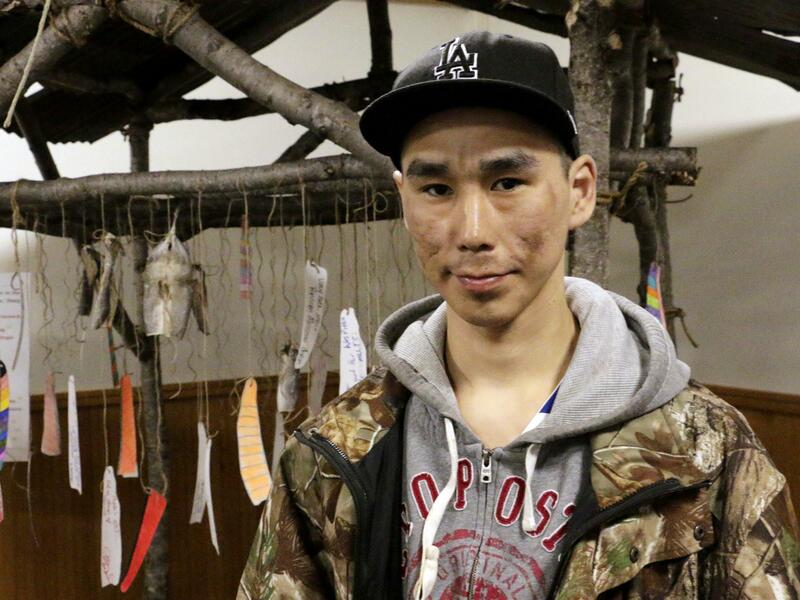 After assisting in an unexpected birth last winter, Nathan Lake of Chevak has received the 2017 Yukon-Kuskokwim Health Corporation Health Aide of the Year Award. “One of the things we really appreciate about Nathan is he is such a great worker. He has such a great attitude. Whenever we ask him to do something, he’s always willing to stand up and do that,” said Rahnia Boyer, YKHC’s Vice President of Village Health, who presented the award to Lake amid great applause at the health corporation’s annual Tribal Unity Gathering on Wednesday. The award recognized not only Lake's work, but his service during one event last winter in Chevak. It all started with a phone call in February 2016. “It wasn’t expected at all. I just received the call at work saying the mother was in labor and felt like the baby was coming out, and we went to the clinic and it happened,” said Lake. For eight hours, the health aide helped the mother prepare for her coming baby, calling a doctor in Bethel every 15 minutes to report the mother’s progress. “Everything worked out smooth, and I even got a hold of the PA from Hooper Bay to come to Chevak to deliver the baby,” said Lake. For his work, YKHC initially recognized Lake as Health Aide of the Month in February 2016. On Wednesday, Lake became YKHC’s 2017 Health Aide of the Year. The 27-year-old’s start in the medical field began three years ago with another baby - his own. Though Lake grew up in Chevak where his mother worked as a health aide for 16 years, he never saw it as a path he would take. The unexpected twist, driven by the need to support his family, has grown into a source of purpose for Lake. The job is demanding in one of the region’s largest communities with one of the busiest clinics. Lake has had another child since he began working with YKHC: a four-month old daughter. He’s also helped deliver another baby since last year's incident. Health aides are trained to deliver babies in emergencies, but YKHC encourages pregnant mothers to travel to Bethel four weeks before their due date to deliver at the regional hospital where more medical services are available. Lake received a plaque, a gift certificate, and Alaska Airlines tickets to Anchorage as part of his award.